My granddaughter on her 7th birthday had a Tea Party birthday party. 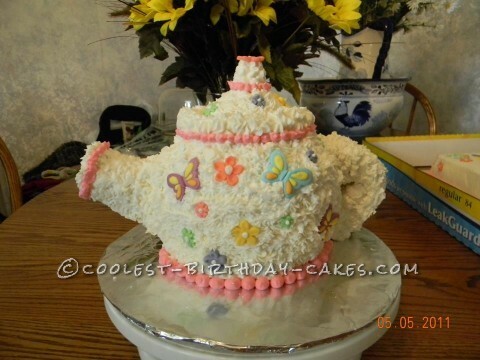 She wanted me to make her a Tea Pot Cake. This was going to be a challenge. I had never made a Tea Pot cake before. I ended up using the giant cup cake mold which worked out great. For the handle I used rice crispy treats that I had shaped into a handle. I had to use tooth picks to hold it on to the cake. It was a chocolate cake covered in home made butter cream frosting piped with a star tip. The flowers and butterflies are made from royal icing that I had made in advance to dry. All the little girls were amazed with the Tea Pot Cake. They did not know at first it was a cake. I also made a small sheet cake to go with the. It was decorated with the same flowers and butterflies.